1The Mina & Everard Goodman Faculty of Life Sciences, Bar-Ilan University, Ramat-Gan, Israel; 2Department of Environmental Science and Agriculture, Beit Berl College, Kfar Saba, Israel. Copyright © 2013 Yevgenia Shebis et al. This is an open access article distributed under the Creative Commons Attribution License, which permits unrestricted use, distribution, and reproduction in any medium, provided the original work is properly cited. There are two major groups of antioxidants in living cells: enzymatic antioxidants and non-enzymatic antioxidants. These groups are divided into several subgroups. The enzymatic antioxidants are divided into primary and secondary enzymatic defenses . The primary defense is composed of three important enzymes that prevent the formation of and neutralize free radicals: glutathione peroxidase, which donates two electrons to reduce peroxides by forming selenols and also eliminates peroxides as potential substrates for the Fenton reaction; catalase, which turns hydrogen peroxide into water and molecular oxygen—one of the most important and efficient antioxidants known today, when just one molecule of catalase converts 6 billion molecules of hydrogen peroxide ; and lastly, superoxide dismutase, which converts superoxide anions into hydrogen peroxide as a substrate for subsequent catalase action. The secondary enzymatic defense includes glutathione reductase and glucose-6-phosphate dehydrogenase. Glutathione reductase reduces glutathione (antioxidant) from its oxidized to its reduced form, and by this recycling, to continue neutralizing more free radicals . Glucose-6-phosphate regenerates NADPH, which creates a reducing environment. These two enzymes support the primary enzymatic defense antioxidants and do not neutralize free radicals directly. The group of non-enzymatic antioxidants contains several subgroups, the main ones being: vitamins (A, E, C), enzyme cofactors (Q10), minerals (zinc and selenium), peptides (glutathione), phenolic acids, and nitrogen compounds (uric acid) . There is great importance in maintaining the fragile balance between these antioxidants and the ROS molecules. For instance, in humans, disturbing this balance can cause serious health problems, such as cancer, cardiovascular and neurodegenerative diseases, and premature aging . Nowadays, most food & pharmaceutical products contain synthetic antioxidants. These compounds are added to food in order to prolong product shelf life, mainly by preventing the oxidation of unsaturated double bonds of fatty acids. In pharmaceutical products to antioxidants are added to enhance the stability of therapeutic agents that are susceptible to chemical degradation by oxidation. The two most common synthetic antioxidants used today are butylated hydroxyanisole (BHA) and butylated hydroxyltoluene (BHT). Propyl gallate and tert-butylhy-droquinone (TBHQ) are other widely used synthetic antioxidants in the processed-food industry. For example, TBHQ is usually added to food products such as beef and chicken. Though no harmful effect of these synthetic antioxidants has been shown in man, in 2012, the European Food Safety Authority (EFSA) evaluated information regarding several of these antioxidants and established revised acceptable daily intakes of antioxidants for human consumption, setting a proper scale for their use by food companies . Ascorbic acid derivatives, such as ascorbic acid and erythorbic acid; thiol derivatives, such as thioglycerol, cysteine, dithiothreitol, and glutathione; sulfurous-acid salts, such as sodium sulfite, sodium formaldehyde sulfoxylate, and tocopherols, are widely used in the pharmaceutical industry. Unfortunately, new data indicating that the synthetic antioxidants used in the industry could have carcinogenic effects on human cells resurface every year, thus fueling an intense search for new, natural and efficient antioxidants. Photosynthesis is an important source of cellular oxidants, and the importance of antioxidants in maintaining high rates of photosynthesis has been shown in many studies . Studies showed that photosynthesis is the source of reactive oxygen species (ROS) and that the photosynthetic electron transport chain operates as a regulatory system for minimizing ROS production in an aerobic environment. In addition, there is a need for a strong and efficient antioxidant network to process ROS effectively and to maintain intracellular ROS pools at low levels . Originally, ROS were recognized as toxic by-products of aerobic metabolism, molecules that have the potential to cause irreversible damage to photosynthetic components and that are removed by antioxidants and antioxidative enzymes. Now, it has become clear that these molecules play an important signaling role in plants, controlling processes such as growth, development, and even programmed cell death . Due to the recent findings, it is of great importance to maintain the fragile balance of the ROS molecules and antioxidants. Plants usually contain a wide variety of free-radical scavenging molecules, such as phenolic compounds, nitrogen compounds, vitamins, and more [11-14]. Studies have proven that many of these antioxidant compounds exhibit anti-inflammatory, anticarcinogenic, antibacterial, antitumor, or antimutagenic effects in cells [15-19]. Nowadays, the intake of natural antioxidants is associated with reduced risks of cancer, cardiovascular disease, and other diseases. It has been widely proven that green tea leaves contain a high concentration of polyphenols that act as antioxidants both in vitro and in vivo (in animal and human cells), thus reducing and controlling ROS molecules [20, 21]. Studies conducted on Chinese medical and other medical herbs demonstrated that some herbs, such as rosemary, sage, thyme, and bay, have much stronger antioxidant activity and contain significantly more phenolic acids than common vegetables and fruits, which are considered good natural sources of dietary antioxidants [22, 23]. Due to the widespread use of synthetic antioxidants in food & pharmaceuticals, scientists are also attempting to develop new and efficient antioxidants from another alternative source found in nature in large amounts—the algae. Algae are widely available aquatic plants containing natural antioxidative compounds, having biological activities that affect the pathogenesis of several diseases, with a relatively low-cost isolation/extraction process . Seaweeds and microalgae make up a big group of photosynthetic marine and freshwater organisms that have adapted to survive in highly complex and competitive environments, including fast temperature changes, different light intensities, nutrient deficiency, pH changes, and more. The microalgae are the ocean’s primary producers, being consumed by other marine organisms for their metabolic energy-requiring processes along the food chain. Recent studies have shown that some species of algae contain large amounts of antioxidants and phenolic compounds. Natural antioxidants found in algae play an important role against various diseases and ageing processes by protecting the cells from oxidative damage [25,26]. It has been shown that the red, brown, and green algae, as well as cyanobacteria, display high radical scavenging activities [27-29]. The main antioxidants found in algae are vitamins C and E , carotenoids (β & α-carotene, zeaxanthin, neoxanthin, etc.) [31-34] polyphenols , and chlorophylls . In addition, red and brown algae contain high levels of folic acid and folate derivatives . The microalgae are an extremely diverse group of organisms and represent a very important and yet-to-befully-used resource of valuable bioactive compounds and biochemicals, such as antioxidants, polysaccharides, pigments, fatty acids, vitamins, and more. For example, Dunaliella salina is the most suitable organism for the mass production of β-carotene as it can produce up to 14% of its dry weight and can be easily and rapidly cultivated compared to plants [38,39]. As it is well known, β-carotene is one of the most common food colorants in the world and has been applied to a wide range of food and beverage products, improving their appeal to consumers, besides its antioxidant function. Studies show that algae play an important supporting role in the prevention of or recovery from a variety of diseases, including cancer [40, 41]. Moreover, studies show the great benefits of the cyanobacteria in the prevention of cardiovascular disease, nonalcoholic fatty liver disease, and more. One of the most talked about cyanobacteria that can be used as a dietary supplement is Spirulina. We use two species of these cyanobacteria in order to produce the supplements Spirulina platensis (SP) and Spirulina maxima (SM). Supplementation with these species of Spirulina resulted in lipid-lowering, antioxidant, and anti-inflammatory effects [42-46]. Moreover, its therapeutic benefits were seen in a variety of diseased conditions, such as hypercholesterolemia, cardiovascular diseases, viral infections, and cancer . Furthermore, due to its high nutritional value, Spirulina was recommended by the European Space Agency (ESA) and National Aeronautics and Space Administration (NASA) as one of the primary and important foods during long-term space missions . In addition, in 2011, the Dietary Supplements Information Expert Committee (DSI-EC) of the United States Pharmacopeial Convention awarded Spirulina (SM and SP) the highest possible safety rating and concluded that it is generally safe for consumption. It is noteworthy that the Spirulina species were used in antiquity as a proteinaceous food around Lakes Tchad in Africa and Texcoco in Mexico . With the increasing need to scout for new natural sources of antioxidants, more and more species of algae are now being checked. It was found that industrially cultivated samples of Botryococcus braunii, Neochloris oleoabundans, Isochrysis sp., Chlorella vulgaris, Phaeodactylum tricornutum, Turbinaria ornate, Gayralia oxysperma, Chaetomorpha antennina, Sargassum vulgare, Undaria pinnatifida, Himanthalia elongate, Chondrus crispus, and much more, possess a high antioxidant capacity and could be potential new sources of natural antioxidants [40,50,51]. There are two common methods in use today in the search for antioxidative reactions in algae. The first assay is lipoxygenase-activity determination. There are several methods for assessing this activity. The most commonly used of these methods is based on the fact that hydroperoxides generated from the action of the lipoxygenase on linoleic acid with an uptake of oxygen contain a conjugated diene that strongly absorbs UV light at 234 nm. Reaction rates can be determined by measuring product formation through the changes in absorbance. This method can be combined or used separately from the rate of O2 consumption which is followed by an oxygen electrode [52-54]. Another assay is the ferric-reducing ability of plasma (FRAP), which is the most commonly used assay for determination of antioxidant capacity. This is based on the reduction of the ferric to ferrous ion at low pH, which causes a colored ferrous-tripyridyltriazine complex to form. Comparing the absorbance changes at 590 - 593 nm of the reaction mixtures to that of known concentrations of mixtures (usually ascorbate or α-tocopherol) containing ferrous ions, gives us the FRAP value of our test mixture. This assay gives fast and reliable results whether with a single or a mixture of antioxidants in various solutions. The reaction is linearly related to the molar concentration of the antioxidant . 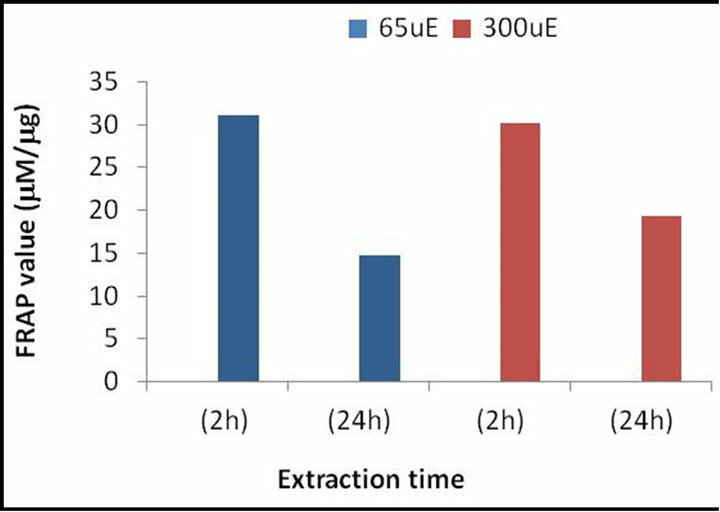 An example of antioxidant activity in microalgae, using FRAP method, are presented in Figures 1 and 2. Figure 1. Total antioxidant activity presented as total mean FRAP value in mM per mg crude extract of dry Ankyra sp. The algae were grown under different light intensities, i.e., 65 and 300 mmole quanta m−2∙s−1 (uE). Figure 2. 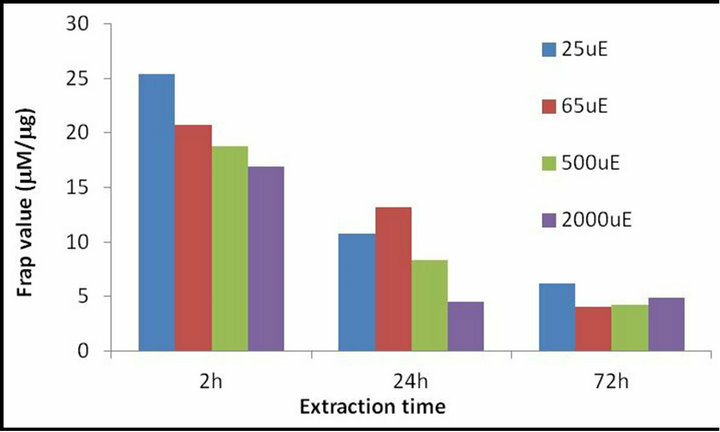 Total antioxidant activity presented as mean total FRAP value in mM per mg crude extract of dry Dunaliella salina. The algae were grown under various light intensities 25, 65, 500 and 2000 mmole quanta m−2∙s−1 (uE). Regular consumption of vegetables and fruits has been recognized as reducing the risk of chronic diseases . Studies demonstrate that an antioxidant-rich diet has a very positive health impact in the long run [57,58]. It is a well-known fact that citrus fruits (oranges, lemons, etc.) contain a high amount of natural antioxidants, such as vitamin C. Blueberries, strawberries, grapes, plums, prunes, red beans, spinach, kale, broccoli flowers, alfalfa sprouts, and more have been proven to contain a high amount of antioxidants and have been incorporated into many dietary menus [59,60]. Furthermore, there are some new and unique antioxidants that have been discovered in spinach. NAO is an aqueous spinach-leaf extract that contains derivatives of flavonoids and p-coumaric acid. The biological activity of NAO has been shown to be beneficial in preventing prostate cancer. Moreover, glucosylated flavonoids that were found in that extract exhibit anti-inflammatory activities . Recent studies also suggested that fruit-like jackfruit, araticu-domato, pindo palm, and mandacaru-de-trêsquinas are good sources of vitamins C and A and phenolic compounds [62,63]. In addition, there are studies that research genetic, chemical, or biological modification in order to increase the antioxidant potency of fruits . The most common antioxidants given as food supplements are vitamins C (aka ascorbic acid and ascorbate) and E. Vitamin C is a cofactor in enzymatic reactions, including several collagen syntheses and an electron donor, which makes it a potent water-soluble antioxidant in humans. If these reactions are disrupted or damaged, they can cause severe health problems, such as scurvy . Furthermore, studies showed that some gene expression and protein assimilation functions are dependent on dietary vitamin C . Vitamin E is a fat-soluble antioxidant whose function is to stop the production of ROS formed due to fat oxidation. Among other functions, it is involved in cell signaling, gene expression regulation, immune function, and other metabolic processes . Current medical supplements of vitamin E usually provide only synthetically produced α-tocopherol, whereas natural supplements provide mixed tocopherols and contain the eight isomeric forms of α-tocopherol. Both vitamins are produced today both synthetically and from natural sources. It is said that the naturally produced vitamins have a much higher percentage of absorbance in the human body. The regular intake of these vitamins is associated with a reduced risk of chronic diseases, such as cancer, cardiovascular disease, and cataracts, through their antioxidant mechanisms. The antioxidant supplement market has been increasing rapidly for the past several years. The global vitamin and supplement market is worth close to $68 billion, with the US being the world leader in terms of market share for vitamins and supplements with around 30% of the world market. In 2010, vitamin E imported by the EU reached up to $421 million and vitamin C-$361 million. In addition, according to Business Insights, the vitamin and mineral market in the US will see compound annual growth of 4.5%, nearing $30 billion, in 2015 . As already said, the main goal of researchers today is to find natural antioxidants that will replace the synthetic ones in the food, pharmaceutical, and cosmetic industries . Though it has not been proven that synthetic antioxidants are harmful to human cells, the EFSA has been carefully monitoring their amounts, preventing food companies from exaggerating in their dosages. Seaweeds and microalgae are a common, available, and valuable potential source of natural antioxidants. They have a very high concentrated nutritional value, containing a variety of vitamins and other non-enzymatic antioxidants, and are relatively inexpensive to mass-produce and extract. Furthermore, several studies have shown the multiple benefits of some algal species in preventing chronic and even lethal diseases. It is more imminent than ever that algae might become the main future source of natural antioxidants (Figure 3). Figure 3. 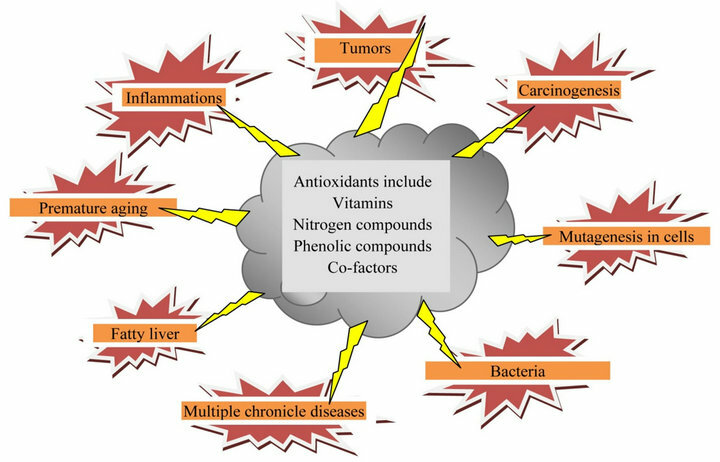 Summary of antioxidant activities preventing common-disease conditions. and Technology, the “Varda Rabin” Foundation, NATO sfp 981,883.